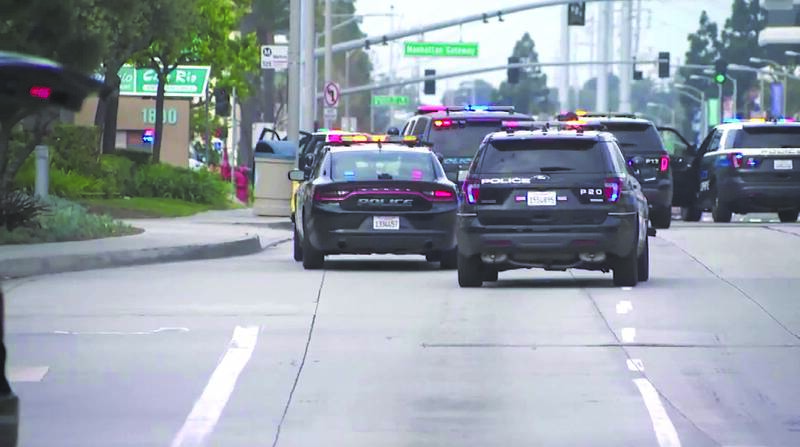 Gunfire erupted on Rosecrans Avenue Sunday morning, sending hundreds of people running and screaming and eventually resulting in a Hawthorne police officer being wounded. After a massive police response involving all nearby agencies, a male suspect was arrested in what police believe was a domestic dispute that erupted at the SpringHill Suites in Hawthorne, near the border of Manhattan Beach. Social media immediately was in a frenzy. Photos popped up showing police-operated armored vehicles rolling down Rosecrans. According to Hawthorne police, the incident began at 9:20 a.m. when a domestic dispute was reportedly occurring at the hotel. Witnesses saw a man in military fatigues carrying a firearm chasing a woman. By the time officers arrived, he had fled across Aviation Boulevard into the parking lot of the Manhattan Gateway Shopping Center, near Cafe Rio and REI. A gunfight ensued in which an HPD officer was shot in his leg and the suspect in his torso. After his detainment, police withheld the man’s identity but indicated he was a former U.S. Marine. Manhattan Beach Police Department personnel responded but were not involved in the gunfight. HPD Chief Michael Ishii, in a press conference later that morning, that the officer’s injuries were not life threatening. Less than 10 hours later, just outside the HPD station, things did get worse. A man allegedly fatally shot the mother of his toddler in the midst of a custody exchange. Jacob Munn was arrested three hours later after an extensive, multi-agency manhunt, and charged with the murder of his ex-girlfriend, 28-year-old Brenda Renteria. “I’ve never seen anything like this before,” Lt. Scott Hoglund, a sheriff’s homicide detective, told the LA Daily News.